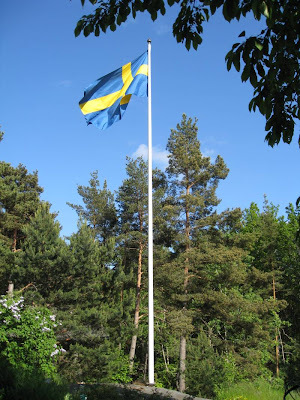 I have no real relationship to the Swedish National Day, June 6. No real traditions or "musts". I wouldn't mind having them - after all - I am a Swedish alien and I love to observe all Swedish holidays. Today was the first day back on the island after a pretty hectic week in Stockholm, and I just didn't have the energy to get off the island again. So, we raised the flag and enjoyed a nice (but still pretty cold) day in the archipelago. At night we lit a fire and watched the live shows from downtown Stockholm. Next year I'll plan a bit better and make sure there is energy left to go downtown to celebrate in some way - find a new tradition and a little "must". I'm sure if they ever decide there is an official song for Nationaldagen, it will be composed by Tomas Ledin. Och så har du varit på Gotland, den underbaraste av öar. Saknaden till Gotland finns alltid hos mig. Älskar den ön!! Och vackert väder fick ni när ni kom, jag har förstått att det annars varit mer än lovligt kyligt denna vecka. 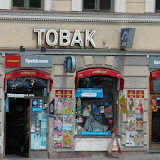 men vi ska hoppas att den riktiga värmen kommer tillbaka snarast. Kul att alla trivs så bra!!! Vivo en suecia y pues en la region sur no hay un sentimiento de celebracion muy arraigado que se diga...! but midsommardagen is da´big party!! !